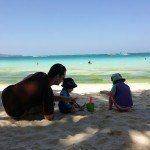 I speak a lot on this website about travelling with kids and today, I have a different take on this thanks to my friend, Janet Dieman, who is an inspirational grandma who travels with her grand kids. I know some of my best memories growing up were exploring the Tasmanian countryside in my grandparent’s campervan, and I have to agree with everything Janet has to say about travel cementing relationships. Read below and be inspired in this special guest post! One day when you look in the mirror, you’ll see someone who looks like me. I call myself The Grammy Who Travels With Kids. But, you’re not there yet. 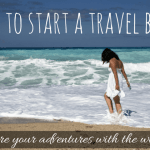 At this point you’ve discovered the riches of travel and share those treasures with your children. You could not give them a better gift or a more important education. You are, of course, raising children who have a more diverse perspective on life and a broader understanding of the world. We can only wonder how these early experiences will shape their future. You live in a time when travel for a young family is possible. This would not have been an option when I was your age. Go for it. Grab all you can. Connect. Learn. Enjoy. Experiencing a different culture has many benefits. Most are obvious – seeing different things, eating new foods, hearing unfamiliar languages, experiencing ethnic and cultural traditions, etc. But I’m preaching to the choir. You travel, so you already know all this. Have you considered yet another dimension of relationship building your children may not have experienced? Intergenerational travel. Your parents paired with your kids. When you put these two generations together, magic happens. If your parents are like most, they cherish their grandchildren. However, they seldom have time alone with them. When grandparents and grandchildren travel together, they experience the same rewards you enjoy. More importantly, they build bonds and make memories. Your children benefit from the wisdom and perspective your parents garnered over a lifetime. Your children strengthen a link to their heritage, especially if your parents relate stories about their parents and grandparents. Your children are grounded by those who came before. Your parents benefit from the priceless joy of time alone with their grandchildren. You benefit from a little time off duty. Not that you don’t love your kids. But, a change of pace is always welcome. 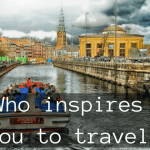 Consider the gifts of intergenerational travel for your parents and children. 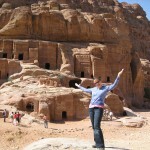 I invite you and your parents to visit my website where you’ll find tips to plan such a trip. We will all be the richer for it. 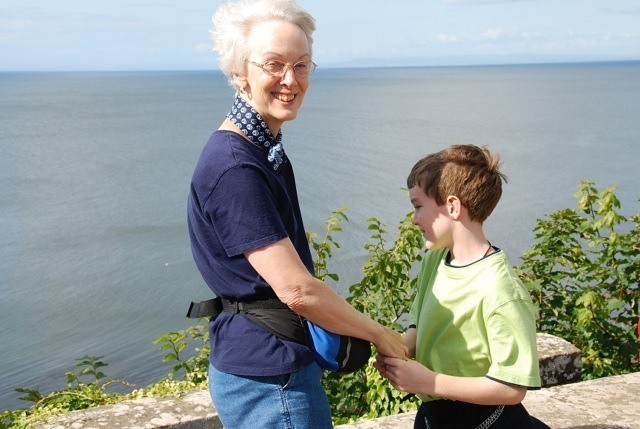 Janet also writes some awesome, interactive kids’ books about travel with her grand kids. Both me and my kids particularly love them. You can see them here. 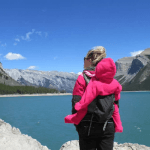 Love it1 I firmly believe that family travel is a bonding experience. My parents don’t travel with my kids on their own, but I ALWAYS take my parents on our travels. A family that travels together, stays together! Amanda, Traveling with three generations is fabulous, and I hope you will continue to do this. However, intergenerational travel is a very different experience. Something happens to kids when their parents are absent. That special something is unique. I’d urge you to propose travel between just your parents and your kids (not always, but occasionally). If for some reason your parents aren’t comfortable with this, I’d suggest when you all travel together that you and your husband plan a day (or several days, individual or consecutive) off doing something away from the group in order to give your parents and kids some “alone together” time. 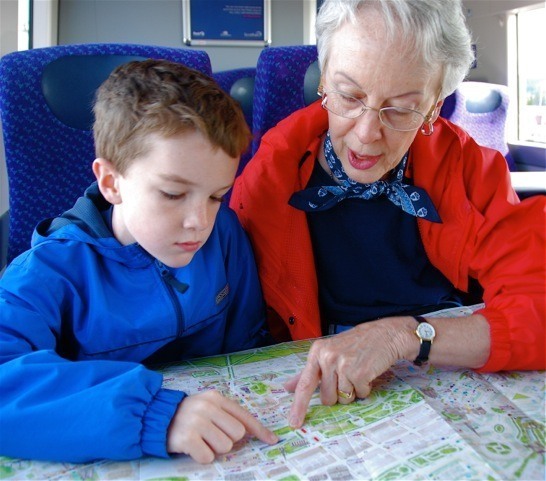 I’m featuring lots of intergenerational travel tips in the months ahead on my website. Take a look. And, ALWAYS keep traveling. Huge advocate of intergenerational travel and of sharing ourselves with families, grandparents, other kids, wat-to-be aunties, etc etc all over the world, mainly through couchsurfing. Amazing to see my children and our family give so much joy to total strangers. We have so much love within our family. Why not share it with the world. How did you get so smart so young? More power to you. Just think of the worldwide connections made each time you share time with others. And the rippling effect of each contact. In a small but important way, this might be the “grassroots” plan for world peace. Plus it allows your children to develop a positive perspective on people throughout the world. Very rich! I hope you broadcast your message far and wide. Let’s get everyone involved.